a bandage applied alternately to two parts, usually two segments of a limb above and below the joint, in such a way that the turns describe the figure 8; a specific bandage used for treatment of fractures of the clavicle. A bandage applied alternately to two parts, usually two segments of a limb above and below the joint, in such a way that the turns describe the figure 8; used primarily for the treatment of fractures of the clavicle. 1. a strip or roll of gauze or other material for wrapping or binding any part of the body. See also sling. 2. to cover by wrapping with such material. Bandages may be used to stop the flow of blood, to provide a safeguard against contamination, or to hold a medicated dressing in place. They may also be used to hold a splint in position or otherwise immobilize an injured part of the body to prevent further injury and to facilitate healing. In horses it is standard practice to bandage the cannons while the horse is being transported, and in some animals while they are exercising or working. The objective is to prevent fluid accumulation and to protect against injury while making rapid foot movements. uses layers of absorbent material on open or contaminated wounds to debride; must be changed frequently. useful for their strength and in some cases slight flexibility. used in dogs to maintain the carpus in flexion, thereby relaxing flexor tendons, while permitting use of the elbow and shoulder. one used to apply pressure, usually to control hemorrhage. one in which the turns cross each other like the figure 8.
used to give warmth, support and protection of the lower limbs of horses; should be 4 in × 10 ft.
a bandage stiffened with a paste of plaster of Paris. one for applying pressure, for the purpose of arresting hemorrhage; pressure is applied directly over the wound. provides protection from pressure over an area, commonly a bony prominence, by redirecting pressure to surrounding areas. Often designed as a ring or doughnut. used for local immobilization, usually for purposes of allowing soft tissue healing. a heavily padded bandage consisting of cotton batting or cotton wool in a wrapping material, sometimes with added stiffening devices such as plastic piping or parallel strips of thin metal. 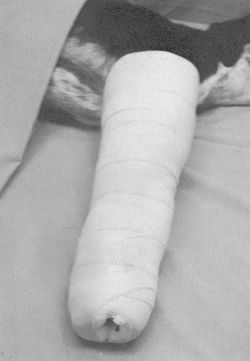 It is applied as a pressure bandage to provide temporary support for a fractured limb prior to plaster immobilization or immediately afterwards. 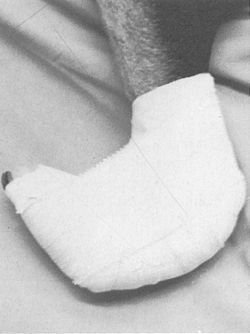 a tightly rolled, circular bandage of varying widths and materials, often prepared commercially. In an emergency, strips may be torn from a sheet or piece of yard goods and rolled. When more than a few inches of length is needed, rolling is essential for quick and clean bandaging. consists of cotton padding, gauze and tape. Provides support and protection of soft tissues. a square piece of cloth cut or torn into strips from the ends toward the center, with as large a center left as necessary. The bandage is centered over a compress on the wound and the ends are then tied separately. Called also many-tailed or spider bandage. a dressing held in place by suture material anchored in surrounding skin and tied over the dressing. Used for postoperative care of skin grafts. material covering the wound is kept moist, sometimes by injection of fluid into the bandage through a fenestrated drain built into the bandage.